There must be contrast for interest. Really. If life/art/people/etc. were all just the same, we would find ourselves uninspired and bored. Ethnicity, culture, race, skin color, height, houses, food, personalities, paintings; if it were all the same, where would be be? I shudder to think. The blandness of sheer repetition would cause dullness of the senses. And so it occurred to me this past weekend when I went to Portland with a friend of mine (katherinetaylor.com). We went in search of potential gallery representation, as well as to enjoy Portland’s art scene. I was struck by the need for contrast. Not only concerning styles of paintings, but contrast within a painting. Contrast is an absolute necessity to create compelling interest. We visited a variety of galleries. There seemed to be a disturbing amount of art that I wouldn’t want in my house. Much of it was seemingly simple, with dark themes, many hung without frames, and at exorbitant prices. Nonetheless, some of it was striking. Of the galleries we visited, a few stood out as representing accomplished artists of a range of styles, all employing the elements and principles of design in a compelling manner. Those galleries were Butters Gallery, Gallery 903, the Augen Gallery, and the Froelick Gallery. Again, we didn’t have time to see them all, but these were the best of those we visited. Of the most noticeable common themes, texture seemed to be often employed element for many artists. 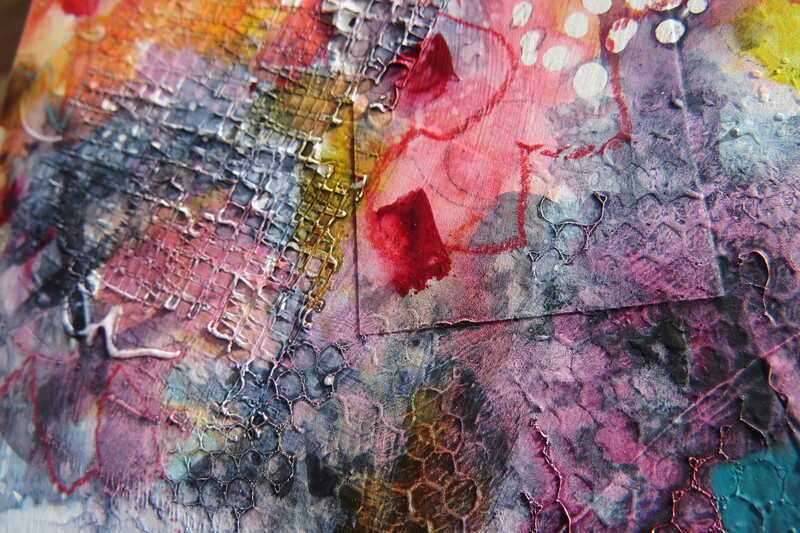 Mixed media, tangible texture, and visual texture abounded. In addition to texture, contrast of value, such as darks against lights created compelling visuals. For instance, in a high-key painting of mostly light values, a shape, or line of black added at a focal point made the work sing. Or, in a mostly black/dark painting of war and oppression, bright spots of flags gave some relief in contrast and made the viewer look closer…longer. So! 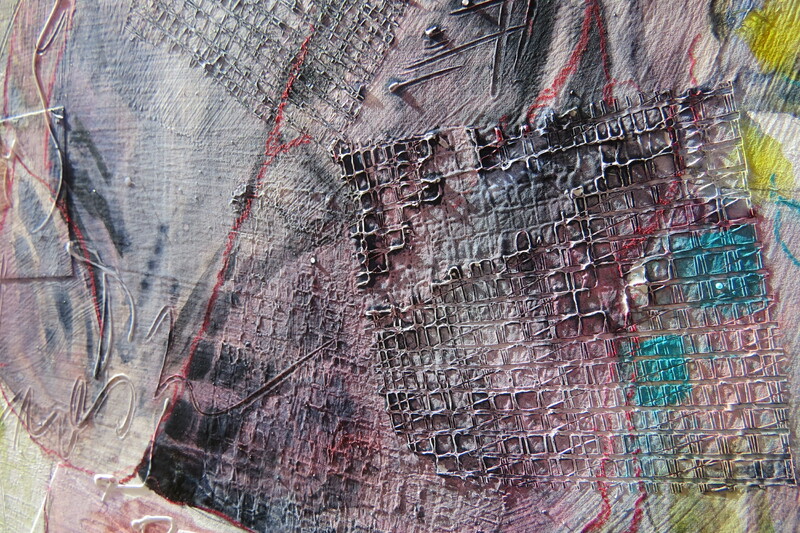 To that end, I have come home very inspired to add contrast and increase texture surface to my paintings. As a result, I took one of my photos from my favorite artistic inspiration locale, Pikes Place Market in Seattle, of a flower vendor. I began with a basic reference photo. 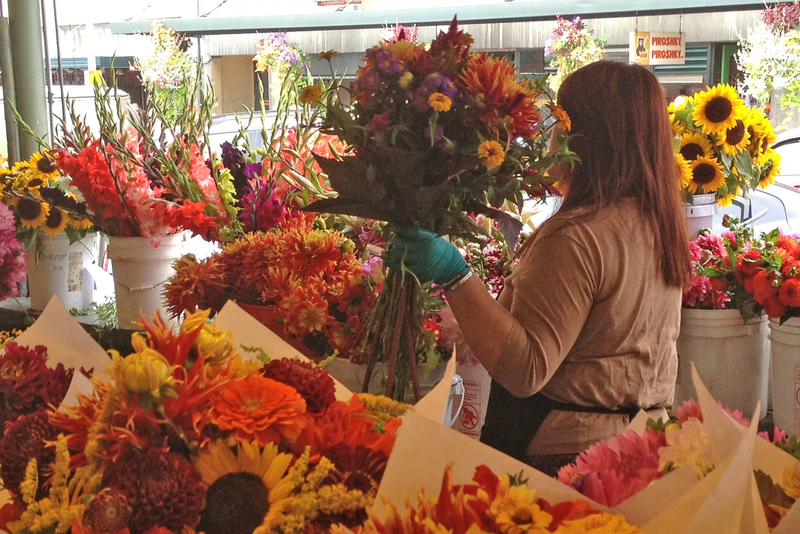 I loved the way the flowers surrounded this girl as she carried a huge bouquet to a customer. 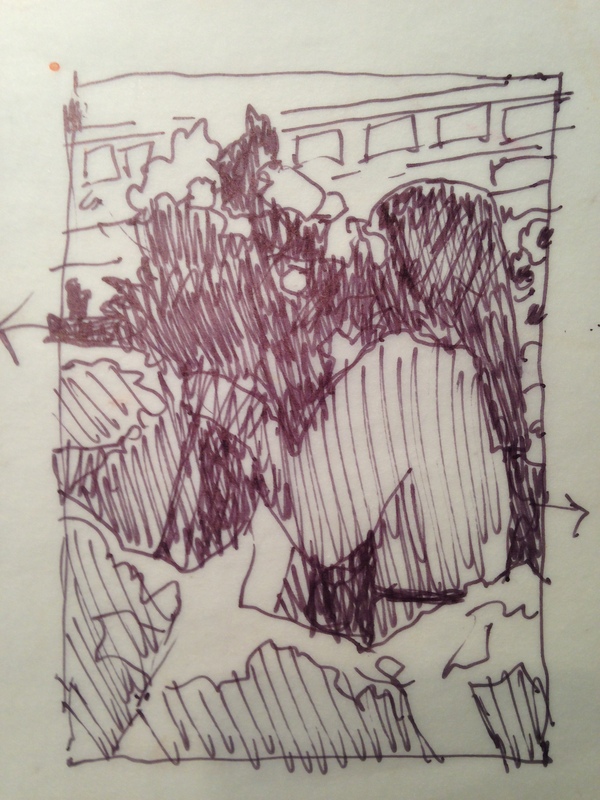 In planning my painting, I cropped in closer to the girl and mapped out my values on a small thumbnail sketch. 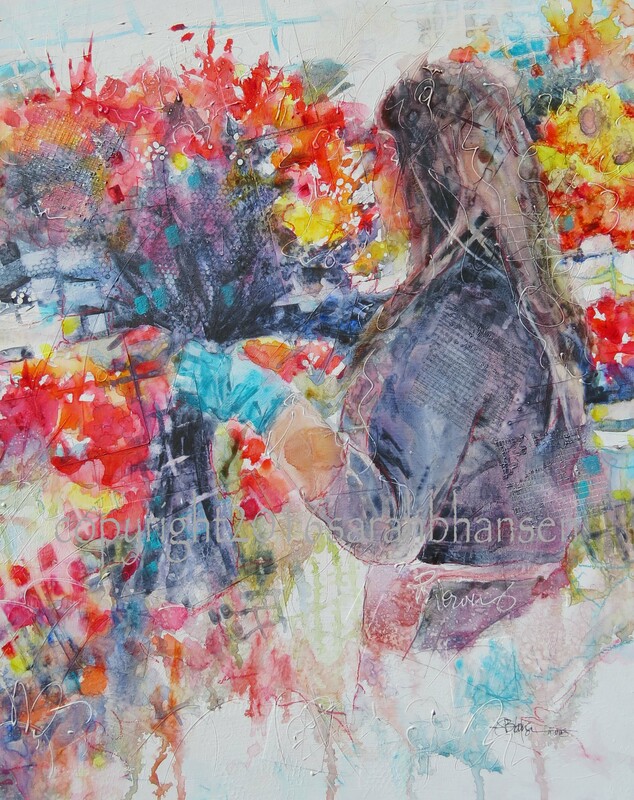 I wanted to produce an edgier painting, so planned a dark mass of value that connected her shirt, hair, and the bouquet to the edge of the painting. Value study. The arrows indicate visual movement of the dark value moving out of the edge of the painting. 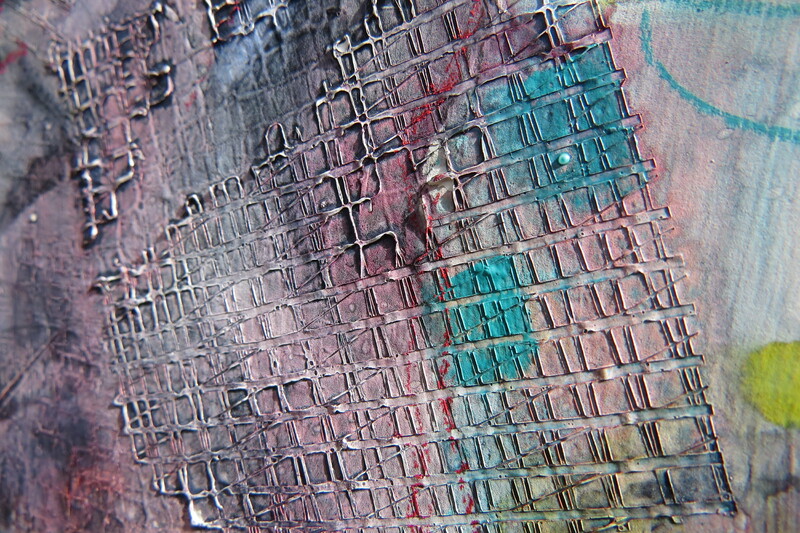 Once I began painting, the texture came through from all the applications in the base of the gesso. This was a recycled painting, as well. It had a former life of being something else (that clearly didn’t work…). I had covered it and textured it up, but a little remained of the painting beneath, adding further interest. Produce netting was used in various spots to create a honeycomb or a grid-like pattern. I added many pops of color onto a neutral background of black/grey/and cobalt. Above, the vendor’s shirt takes on many textures. Produce netting squares, small squares of paper, scribbles in the gesso base, and 3D lines were painted into the surface before the paint was applied. The edge of the bouquet. This detail describes both the netting honeycomb pattern and the painted-in squares of color for interest. 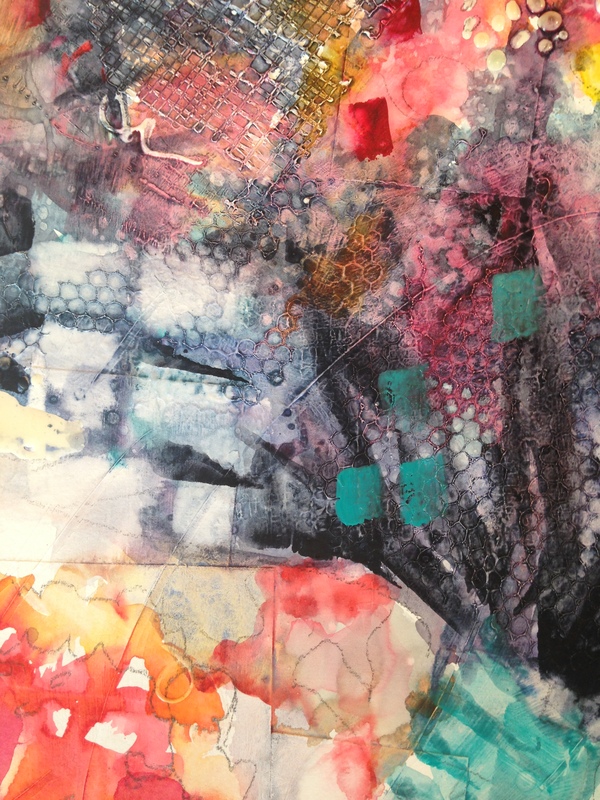 Scribbles and underscoring create complicated patterns in the painting. “Transaction of Color”, 20×16, $550. Original painting. 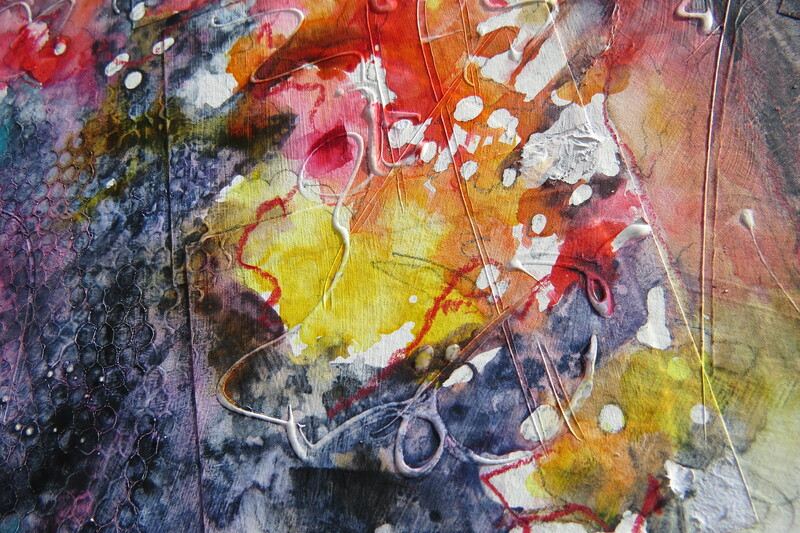 Watercolor on gesso and collage. This painting has a very fresh, open feel, accomplished both by the texture, the massed values, and the bright areas of color. Hopefully you get a chance to view this painting in person. I will be installing it at Hood Avenue Art as soon as it is sealed and framed. 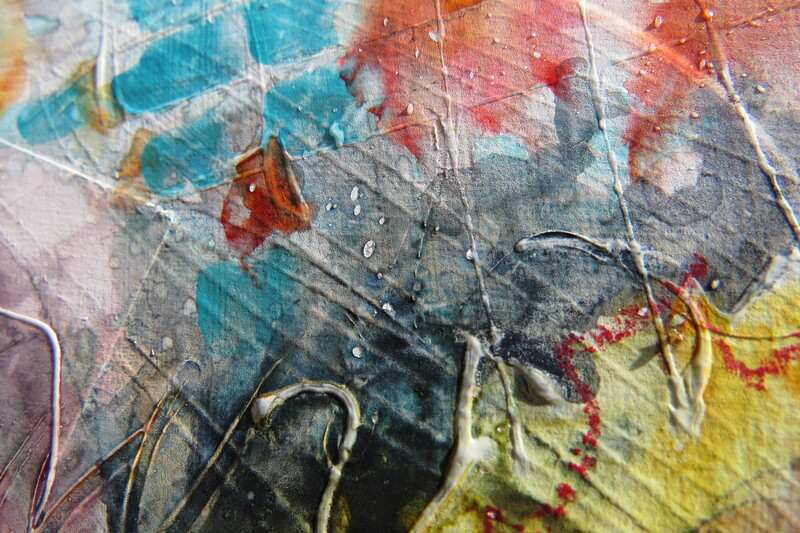 It is very interesting to view the different textures and colors up close. 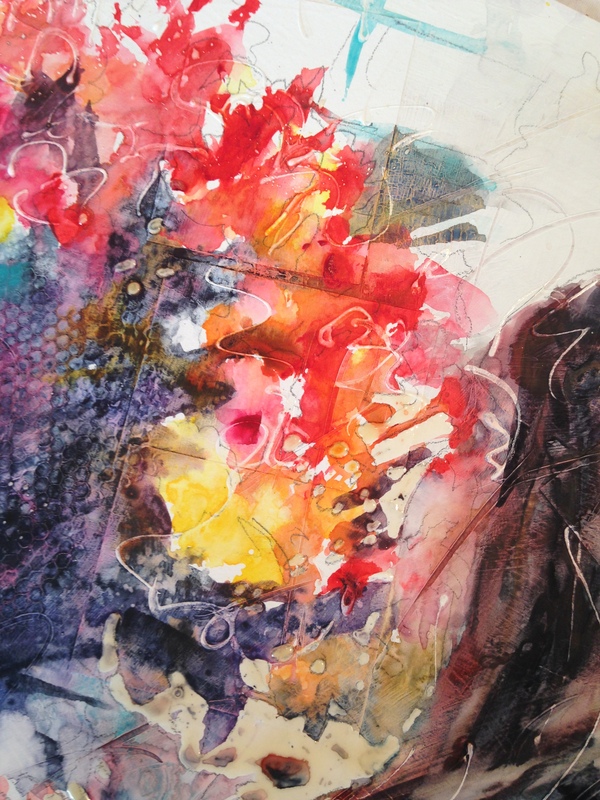 All in all, I believe I captured the contrast I was going after with the almost-blacks, the neutrals with pops of color traveling in pockets throughout the painting, the gestural strokes, patterns, and texture. Look for these qualities to come up in my future work. Expand the mind, people!